After battling the elements for most of the afternoon, Mother Nature finally forced the NASCAR K&N Pro Series East UNOH 100 at Richmond International Raceway to an early end. But the weather didn’t dampen Austin Hill’s victory celebration. Hill grabbed the lead after an early caution and held on until the skies opened, ending the race at lap 70 and giving Hill his second win of the 2015 season in the No. 22 A&D Welding / Don Rich Ford Co. Ford. 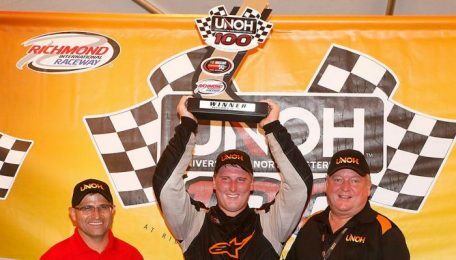 It was the NASCAR Next driver’s fifth career K&N East win. Dillon Bassett earned the runner-up position in the No. 44 Bassett Gutters Ford, his second top five finish in the last three races. Dalton Sargeant drove the No. 51 GALT Chevrolet to a third place finish. Scott Heckert and Spencer Davis rounded out the top five. Points leader William Byron started the race from the pole position and led the early laps but had to settle for a sixth place finish. Trey Hutchens, Kaz Grala and Kyle Benjamin scored positions seven through nine. K&N West points leader Noah Gragson, making his second start in the K&N East, started in the 32nd position after qualifying was cancelled and made his way through the field to complete the top 10. Patrick Staropoli, making his first start of the season for Bill McAnally Racing in the No. 99 AutoNation Toyota, spun on lap 17 after contact with another car sent him into the outside wall. The NASCAR K&N Pro Series East championship will be decided at the season finale at Dover International Speedway on October 2 in the Drive Sober 125.